The Regional Rehabilitation Centre (RRC) provides specialized care to help patients recovering from spinal cord injury, acquired brain injury, trauma, stroke and orthopedic surgery. The state-of-the-art facility provides both inpatient and outpatient services and clinics, a therapeutic pool and an outdoor therapeutic track. 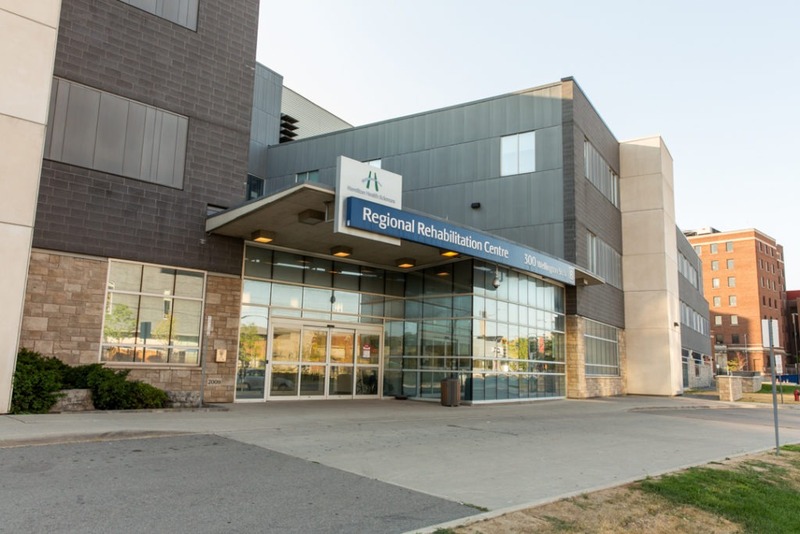 Situated next door (and connected by a pedestrian bridge) to Hamilton General Hospital (HGH), patients at the Regional Rehabilitation Centre have easy access to acute medical and clinical services and resources. Take Queen Elizabeth Way to Highway 403 West (to Hamilton). Take the Main Street East exit. Continue on Main Street to Victoria Avenue. Turn left on Victoria Avenue. Continue on Victoria Avenue and turn left at Birge Street. Turn left onto Wellington Street. Regional Rehabilitation Centre is on the left. Take the QEW towards Hamilton. Take the Nikola Tesla Boulevard (formally Burlington Street East) exit (exit 90). Continue on Nikola Tesla Blvd/Burlington Street East. Turn left onto Wellington Street North. Regional Rehabilitation Centre is on the left. Take the Clairmount Access straight onto Victoria Avenue. Continue on Victoria Avenue, past Barton Street. Turn left onto Birge Street. The primary Hamilton Street Railway (HSR) bus route that services this area is the 2 – Barton, which stops at Barton at Wellington. For information on Bus Routes and Schedules please visit https://www.hamilton.ca/hsr-bus-schedules-fares/schedule-routes-maps.